Voluntaryist Origins II Success! Next Steps On Production! 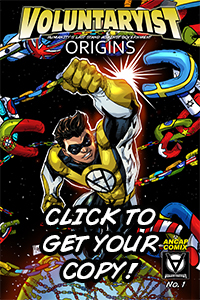 I am ecstatic to announce that Voluntaryist Origins II closed at a record-breaking $5,544 supported by 119 backers, making this issue the highest funded, most received, longest, and most successful Voluntaryist comic to date! Thank you for your generous time and support in not only backing the campaign, but also being a true fan by continually sharing the campaign promo images and links to new faces online! Now that the campaign is closed, the chain of production is beginning, and I will keep you in the loop with updates and teasers along the way. 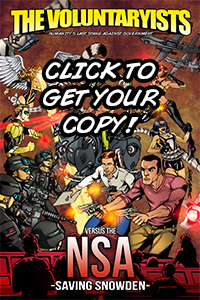 Once Indiegogo releases the funds to me within 1-2 weeks, I will be working with our publishing group, Short Fuse Media, to format the layout for production. The comic will then go into a pencils review process over the course of 1-2 months, with inks, colors, and lettering to follow over the next 1-2 months. 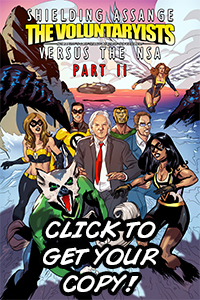 I will be sending out an e-mail message directly to give all backers their BONUS ITEMS, which includes ALL PAST DIGITAL VOLUNTARYIST ISSUES, The Liberty Force digital comic by Johnny Adams, and a digital copy of Heroes Ignited by Short Fuse Media Group. Please be on the lookout for that e-mail from mr.voluntary[at]gmail.com. Make sure to check and ensure that your e-mail and shipping address are correct. If anything changes over time, you are able to update that information on Indiegogo by signing in to your order. I will send a campaign reminder 1 week before shipment to ensure that anyone who has moved can update their address before I send out physical comic perks. If for any reason you made a mistake and forgot to select a perk, PLEASE LET ME KNOW! I care about all supporters and want to make sure that no one made a mistake by not selecting a perk. So please double-check and make sure you selected a perk for your respective pledge, and send me a message if you didn’t select your perk by accident so I can update your order. 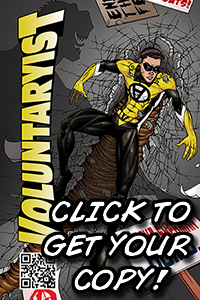 I’m looking forward to making this the best Voluntaryist issue ever, and I know I can because of you! 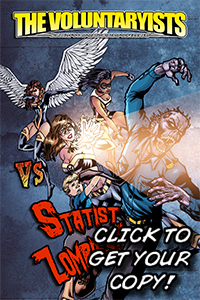 So thank you for believing in me and the series and helping to bring Voluntaryist – The Comic Series, to life!